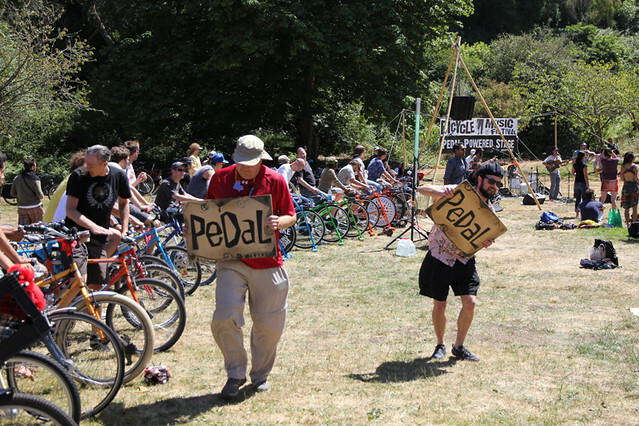 With climate change knocking at our doors, enjoying a human-pedal-powered concert this past Saturday was the least of our worries for all the things that humans could do to contribute to the warming of the planet. The concert was powered entirely by the sweat and calories of human power instead of fossil fuels or electricity generated by fossil fuels. 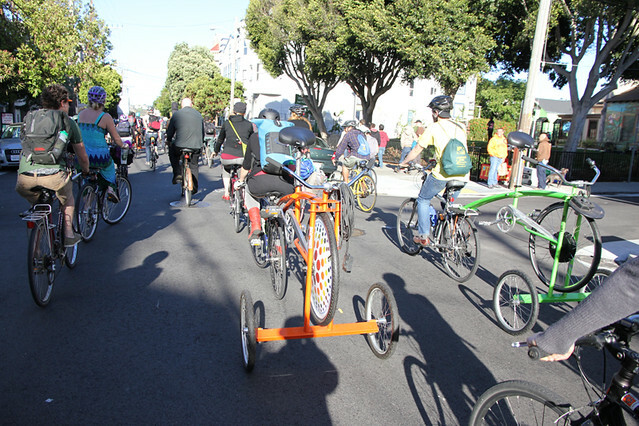 People took turns pedaling on bicycle power generators which created the juice to power all the amps and speakers. 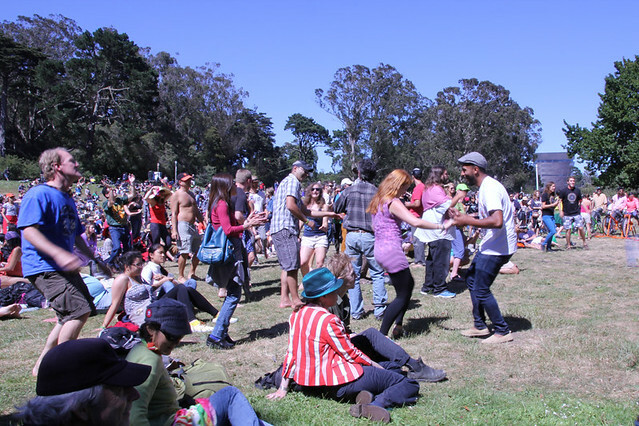 It was their 7th annual event and it was held at Pioneer East Meadow in Golden Gate Park from 12-5 pm and then 6-9 pm in the Mission District. 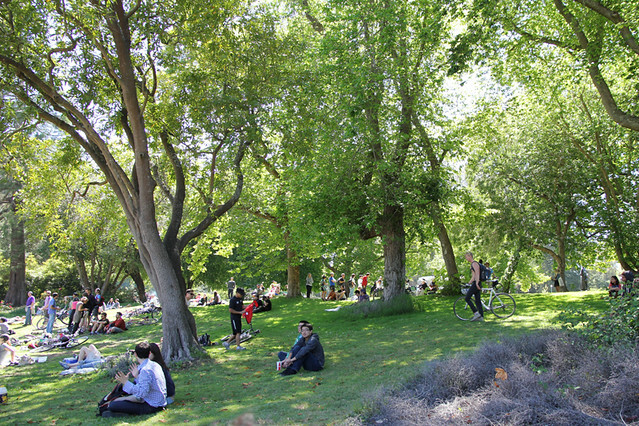 It was the biggest event of its kind in the world and it was free and open to all ages. And this little kid, below, was doing his part. 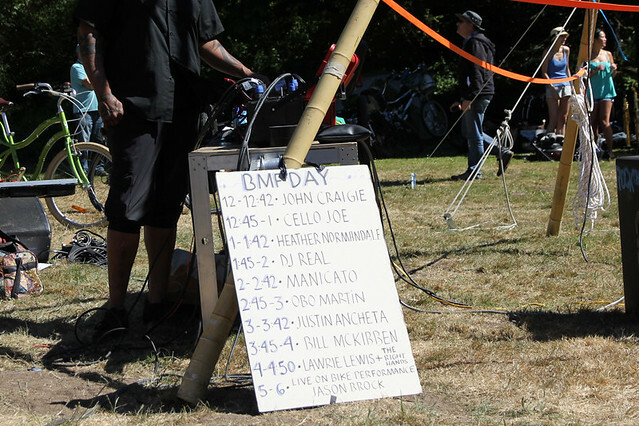 Here was the line-up of musicians written on the board (see photo below). We were sitting almost 300 ft (91 m) away and the music was still loud and clear. No problem powering the speakers with bicycles. Her bike, below, was just too cool. 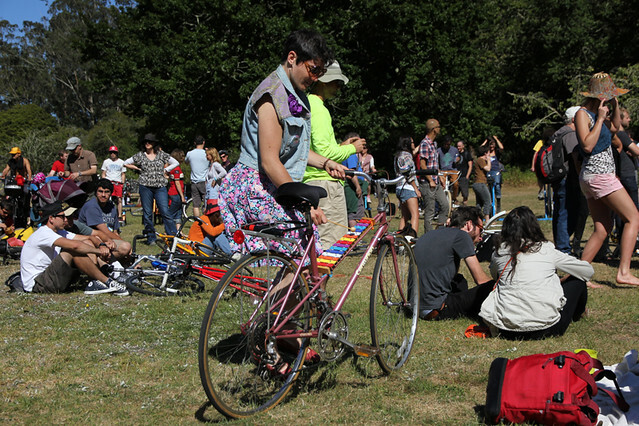 She’s playing a rainbow xylophone on her Centurion Mixte. 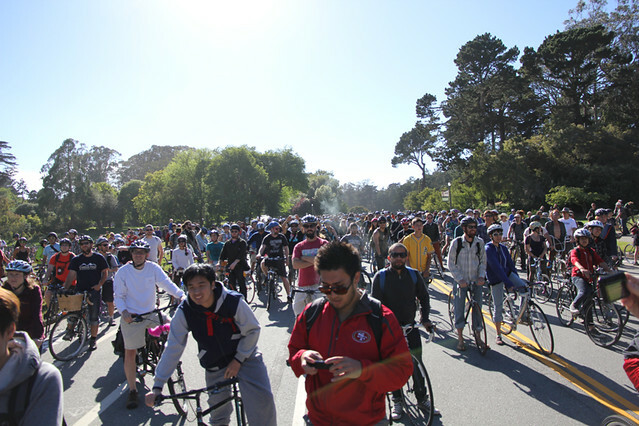 It was announced that there were over 600 bikes locked to the bike racks and in addition, I saw many had their bikes by their side. 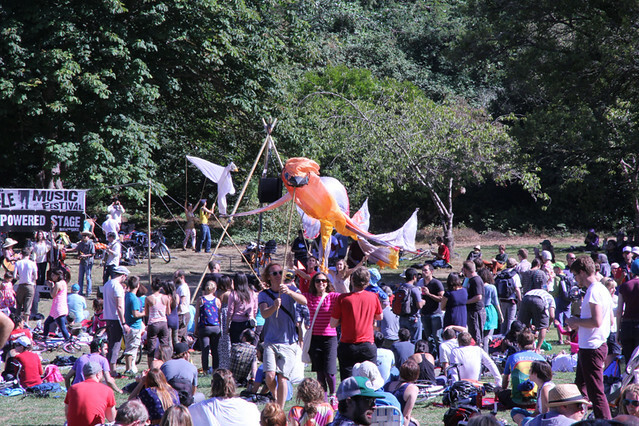 So I estimated a total of about 700-800 attendees at the festival. 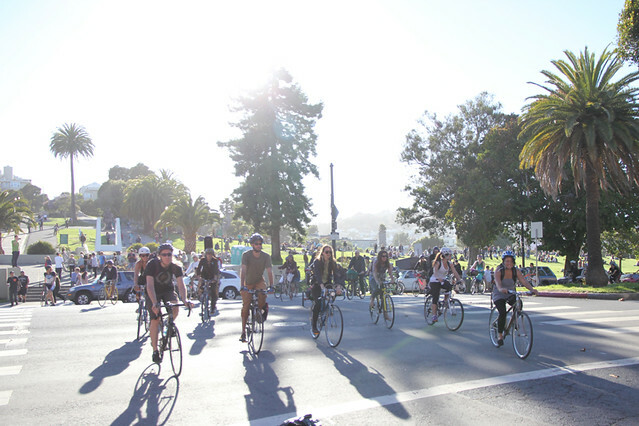 All of these people on bicycles (see photo below) waited till the end at around 5pm for the amazing “Live On Bike” ride from Golden Gate Park to the Mission District. 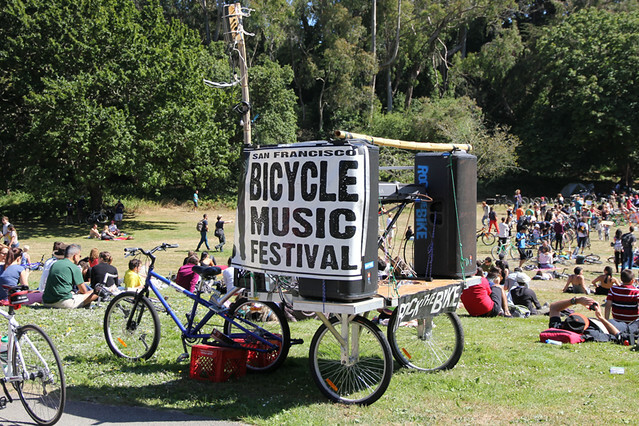 The entire festival got packed up and transported on bicycles to another location in the Mission District with the talented Jason Brock (a finalist from X-factor) accompanying us. It was about an hour long at a slow speed for a distance of 4.5 miles (7.2 km). 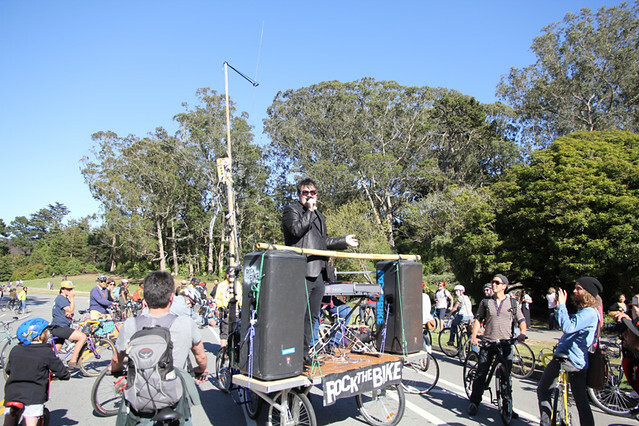 Because there were so many bicyclists, there were 3 loud speakers placed in the front, middle, and at the end of the ride so anywhere you went you could still hear Jason Brock singing. However, I think they needed more speakers. Jason Brock was singing during the entire Live on Bike ride. He sang a couple of tunes from the 80s and improvised some songs which made people laugh. I don’t watch TV shows like X Factor but he was quite talented and hilarious in person, and the fact that he continued singing on the bicycle stage even on rocky streets is pretty good. 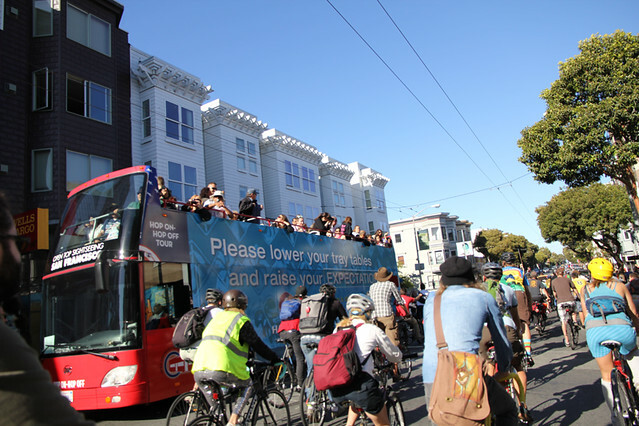 The ride went through Haight Ashbury, onto the Wiggle, then Market St, and through the Castro neighborhood. It was interesting because I felt like we were in a parade within a parade. We were enjoying Jason Brock’s show as his audience but then the people on buses, cars, and sidewalks were enjoying us parading through. 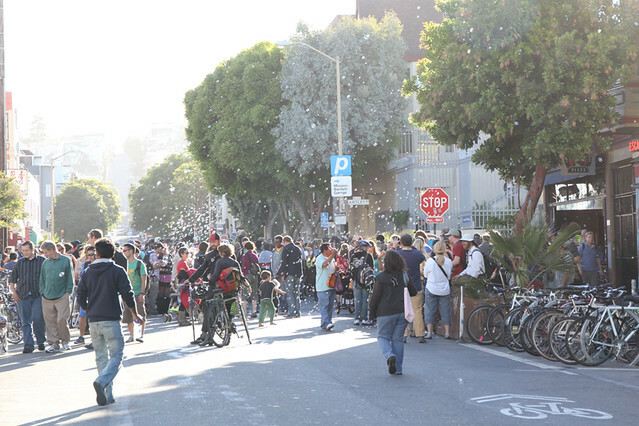 The tail end of the parade near Mission Dolores Park in the Mission. The pedal-powered bicycles were lifted to their next destination using guess what?… bicycle. 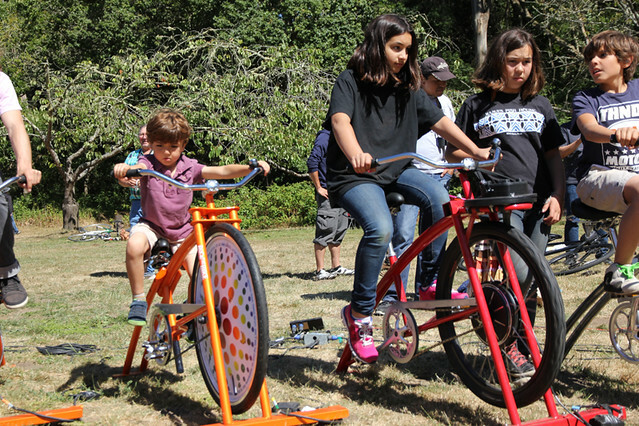 The green bicycle on the right is a blending machine for making smoothies. I tried their smoothies and they were delicious. My buddies and I left for home when we arrived in the Mission. We missed the 3 hour concert, but I hope someone reports on it because I am interested in how it went during the night. 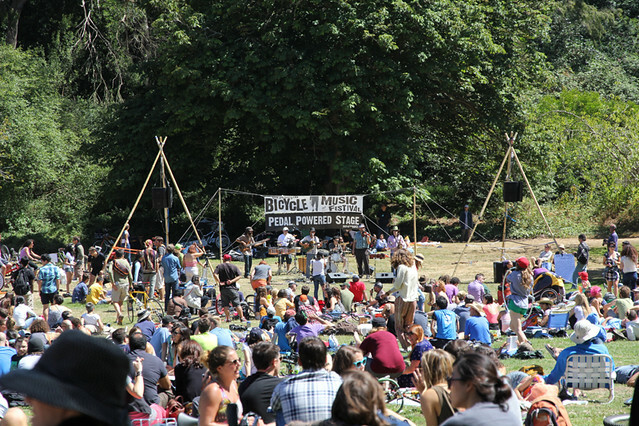 We enjoyed the event very much and I am surprised as to why there aren’t more festivals/events using bicycles to generate energy to power their shows. Hope you come out next time!